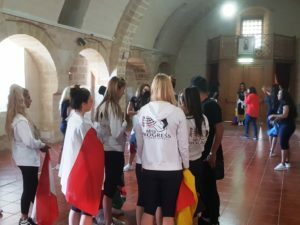 LEPORANO – The final is near and everything revolves around it: from the morning until lunchtime, the girls have tried the choreographies for the show with the talented Amadia Sansonetti, in the Muscettola Castle. Lunch was consumed at the Bellagio of Marina di Pulsano, which served its delicious panzerotti among various delicacies. Thanks to a hot sun the girls took advantage of part of the break to enjoy the Montedarena beach. The rehearsals then started again with the supervision and guidance of the stage director, Tonio Santoro.